Ok, time for some fun. This afternoon I was at my friend's meetup talk in Redfern (God bless therapy! ), discussing things and having a lot of fun. I was reminded of a couple of pretty strange intellectual positions among the left (read: contradictions) that have puzzled me for a while. The left normally consists of quite smart people that for one reason or another are mislead or misunderstands a whole bunch of things (mostly in economics). 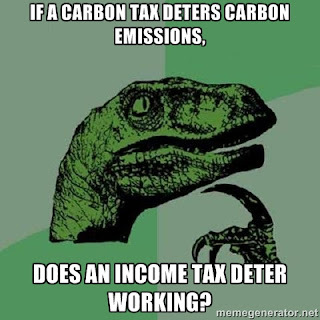 environmentalists and unintended consequences; emissions taxes & income taxes; and consumption taxes & minimum wage laws. 1) Unintended consequences in Ecology vs Economics. The complex interweaving of living things in their environment leads to a central insight in the science of ecology, an idea called the law of unintended consequences. It is virtually impossible to change one aspect of a complex system without affecting other parts of the system, often in as-yet unpredictable ways. Infamous historical examples are the adverse effects of pesticides like DDT, the Nile Perch in Lake Victoria or bunnies in Australia and possums in New Zealand. Most ecologists thus are very modest about their ability to alter an environment in a certain direction. Consequently, most reasonable environmentalists intuitively shudder at the thought of introducing alien species to some environment in order to solve some problem. rather a problem of how to secure the best use of resources known to any of the members of society, for ends whose relative importance only these individuals know. Or, to put it briefly, it is a problem of the utilization of knowledge which is not given to anyone in its totality. Here's the strange part. Progressives and environmentalists, who are normally quite good at understanding the complexities of the ecology fail to remember this insight when talking about what should be done in the economy. Despite the fact that economic systems are even more complex and difficult to overlook that ecologic ones. If acting in an ecological system will produce unintended consequences likely worse than the problem they tried to solve, what makes you believe that the same (or worse) unintended consequences won't arise when you poke around the economic relations between people? Progressives & lefties who ardently want to defend the environment from this evil world of capitalism and economic interests, quite often favours carbon taxes if not outright bans on emissions. The approach has its appeal and the method of taxing what you want to have less of is generally sound. 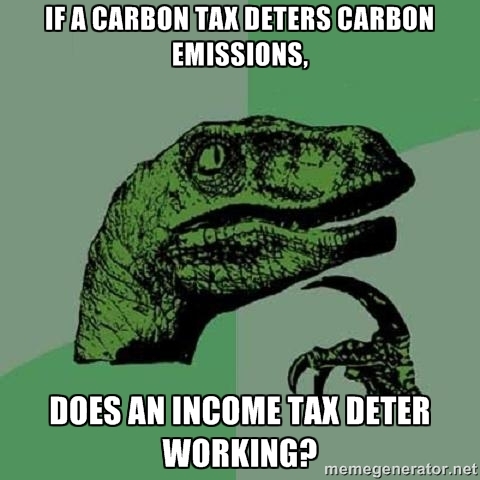 Actual carbon tax or carbon trade schemes (see EU) have not been very successful, partly for political reasons, partly because of unintended consequences (see above). Now, if the method of taxing that which you want to get rid of is sound (which I and lefties alike seem to agree on), what is then the likely effect of payroll taxes or income taxes? Pretty much the same as economists have complained about for decades: it is wasteful, creates unemployment and distorts the labour market - or in other words, deter working. You get less of what you're taxing. This last one is essentially another example of the above reasoning. Taxing bad habits, like smoking, unhealthy foods or alcohol consumption is very popular measures to improve public health. 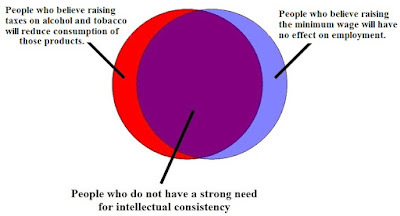 After all, the effect is intuitive and outcome seems just; if it's more expensive to drink, smoke or eat crappy food, people will do less of these things - and when they actually do drink, smoke or eat junk food, they contribute some extra money that can be used for covering health care costs these people are likely to sustain later on. Again, I don't object to the reasoning, and I am sympathetic to the left's cause here. Perhaps the strength and effectiveness is not exactly what they imagine, but that's more of a detail than a principled argument. 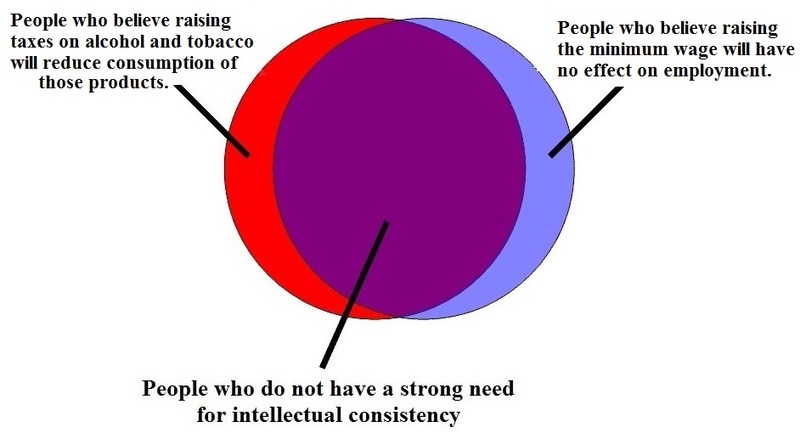 Somehow, my friends on the left seem to lack this 'need for intellectual consistency'. Not that we're very surprised about that. They are lefties, after all.